Healthcare trends serve as a compass for the healthcare industry, indicating where it is headed, and highlighting the disruptive technologies bound to reshape it. These trends also help industry leaders get a greater sense of patient needs and how they can modernize their business models to meet them. Nearly everyone working in healthcare shares the same frustration: executives in this field are timid about embracing the newest healthcare trends. As others have noted, most established companies in the healthcare space are unwilling to abandon antiquated business processes, even when they cost more than innovative, out of the box next-gen methods. The issue isn’t that executives don’t realize the value of some of the most amazing healthcare trends today. Executives in healthcare don’t innovate because they’re afraid. Of failure. Of something new. Of internal battles. Of taking new responsibilities. Of plunging into the unknown. Fear of failure makes healthcare executives hesitate investing in digital. In spite of this nearly universal resistance, the healthcare industry is innovating and navigating a new future. The process is just far slower than one might expect in a field based on discovery. The pressing reality is quite simple: healthcare needs to innovate far more comprehensively and rapidly than is currently the case. It is predicted that the digital revolution can save the healthcare sector $300 billion. 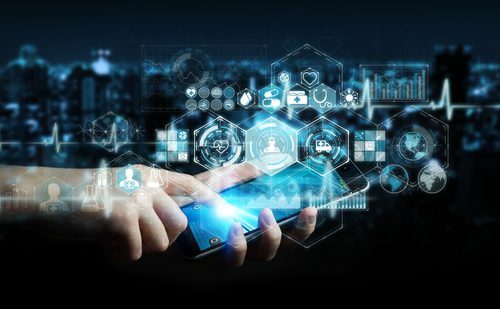 According to a recent study by Accenture, the industry stands to save over $60 billion in the long-term by making the right technological investments today. Whether executives in healthcare like it or not – the industry is transforming itself. From within and from outside of it. That trend will not change, largely because many forces are collaborating to create greater transformation that will only grow exponentially year over year. 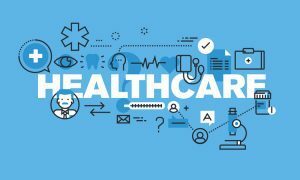 There are 7 healthcare trends currently redefining the healthcare industry that will continue to gather momentum and propel the industry into the 21st century, one company at a time. There is enough evidence to support strong investing in each of these trends, or at least some of them, depending on the type of healthcare company in which you work. Wearable devices have a profound impact on user health. Through a combination of hardware, predictive analytics and mobile apps – wearable technologies are redefining patient diagnostics, disease management and preemptive care techniques. Ever since Apple announced the official launch of CareKit and ResearchKit in 2016 to go along with their Apple Watch Series 3, one point was quite clear: wearable devices would play a huge role in how we think about our health and how we act on it. When Apple starts new thinking – the entire world pays attention. And then tags along. Fast forward two years – there is an interconnected wearable app for nearly everything. Now, life threatening conditions can be better managed through a combination of a physical wearable product that sends data to a website or mobile app for analysis and recommendations. In 2019, wearable devices allow users to share their health records in real time, and receive quicker, more accurate diagnoses. In some cases, they even allow users to manage their conditions on the go. These devices mean that a constant flow of data is available to healthcare professionals, who can use such metrics as blood pressure, breathing patterns, and sleep data to better diagnose and treat patients. Furthermore, omnipresent wearable technology means that patients are empowered to take charge of their own health. User friendly, minimalistic, and unobtrusive features encourage them to be more aware of their daily habits. Wearables have already caused a disruption in the individual wellness and fitness market, with companies like Fitbit and Beddr achieving record numbers in user adoption as well as funding rounds. 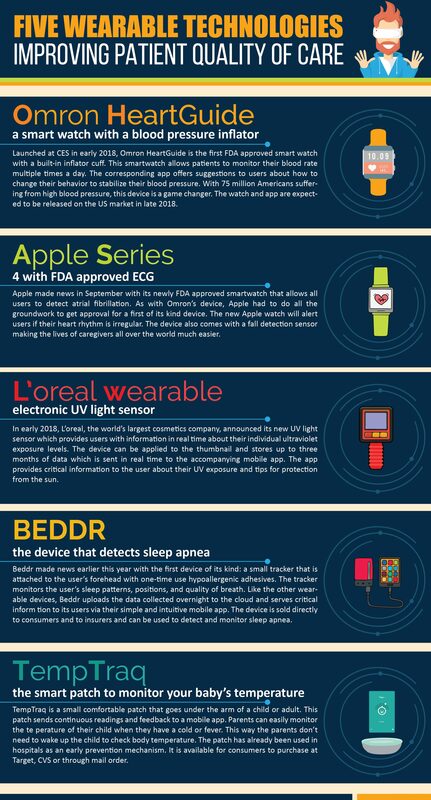 As we can see from these examples, there is tremendous opportunity in the wearable space. According to Markets and Markets, the global market for medical wearable devices is projected to reach $12.1 billion by 2021, representing a significant avenue to look toward for growth. Whereas many of these technologies have been primarily used in the B2C space – smart sensors and sleek wearables are bound to also disrupt the hospital preventive care procedures. More than a buzzword for cryptocurrency, blockchain is revolutionizing the healthcare space by allowing the sharing and analysis of critical patient data in real time to improve quality of care and transparency. Although blockchain technology has been most popularly touted as the exchange mechanism for cryptocurrency, it also has the potential to drive digital transformation in healthcare. But first – a simple definition. Blockchain is a permanent digital record in the form of an open, immutable ledger. And in many ways, it’s nothing new. Since the ‘50s, we’ve had some variation of a digital ledger. We used to call them databases. They were reference ledgers people & companies usually kept for themselves to track their transactions. At the core of the blockchain technology – there are only two innate differences from the traditional digital ledgers. First, the ledger is immutable – which is a fancy way of saying that it cannot be changed on the whim (unlike your google spreadsheet that you can quickly alter). Secondly – the ledger does not “reside” in one central location – instead it is distributed via its network of computers all over the world. When two entities transact with each other on the blockchain – a block is added to the ledger. A block is added only when two parties solve what’s called a hash – a sequence of numbers and letters – which is based, in part, on the previous block in the system. So when a new block is added – its accuracy and validity is confirmed based on the previous block. And if anyone tries to falsify a block – all the agents on the network will know about it. The technical details are important for a healthcare CTO but not for the stakeholders considering whether blockchain makes sense for their business or not. What healthcare executives need to understand, simply, is that if they use blockchain the transaction is safe and secure. Now, why would blockchain matter for healthcare? Because healthcare is riddled with “transactions”. Some are pure monetary transactions – like money changing hands between payers and providers. But other are immaterial transactions – like executing contracts, sharing electronic medical records, or even selling patient data on the open market (e.g. 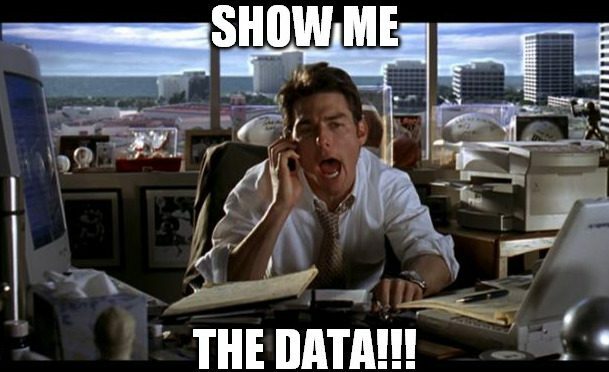 clinical data). Another “transaction” is the very act of communicating securely – over text, mobile apps, phone and other channels or even patient referrals and live consultation. The point is simple: all these interactions between healthcare providers and end consumers can be built, in one way or another, on top of blockchain. Blockchain increases the ease of information sharing between patients and healthcare providers. This means intra-company information is far more secure, and even provides firms with an efficient way to monitor their supply chain workflows. Here’s a short 2 minute video from IBM explaining how and why blockchain is a healthcare trend to pay close attention to and invest in this year. Some up and coming startups in the healthcare space are leveraging blockchain technology to accelerate progress in healthcare. Teledactyl, a Wyoming-based company, eliminates third-party payments by providing payments through cryptocurrency. New York based Embleema made the news after it launched a HIPAA compliant healthcare blockchain network which will allow patients to access and share their medical records. Omny is a blockchain solution providing critical data to drug manufacturers about their products’ on-hand inventory and product availability at hospitals and distributors all over the nation to better optimize their supply chain processes and the drug manufacturing schedules. Blockchain Health Co allows medical researchers to find patients that fit specific criteria for their healthcare studies. Patients who are a fit for medical studies can consent to have their data tracked and can be compensated accordingly. These are just a few examples of innovative blockchain use cases that are currently on the market. We haven’t even scratched the surface of what blockchain can do for healthcare and yet we can see that the future is endless making blockchain one of the most exciting healthcare trends to watch for in the years to come. Telemedicine solutions have slowly and steadily become popular alternatives to doctor visits among underinsured patients. However, telemedicine won’t be able to reach its full potential until new laws are passed to allow doctors to be paid equally for virtual consultations. Telemedicine refers to the remote diagnosis and treatment of patients through digital technologies – and it is showing signs of living up to its potential to drive digital transformation in healthcare. Doctors are increasingly communicating with patients using email, phone, and webcam. Physicians are also communicating with each other, meaning easier collaboration and more informed decisions. This type of interaction would have been anathema 10 years ago. There were an estimated 30 million telehealth visits in the US in 2017, compared to 22 million in 2016. This number is only expected to increase. Furthermore, according to a survey by the Harvard Business Review, 97% of patients were satisfied with their first telehealth experience, and 74% believed that the tool improved their relationship with their healthcare provider — showing that the technology is a step in the right direction. 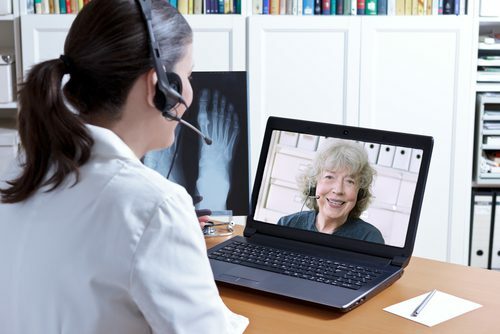 Typically, today’s telemedicine visits are for a fee – usually between $49 and $99 per consult – and are popular among the underinsured or uninsured population. That’s because a telehealth consult is still substantially cheaper than a traditional doctor visit, not including emergency visits. At its core, what allows telemedicine to be one of the most promising healthcare trends on the list is that it can be achieved via the most popular device in America: the smartphone. Almost 240 million Americans own a smartphone (in contrast, there’s only 119 million TVs in the country). Via telemedicine platforms, both doctors and patients with a smartphone can now seamlessly connect with a push of a button via the myriad of telehealth apps to get a quick consult virtually versus having to go to a doctor’s office. In practice, telemedicine has not been as much of a success as all of us have wanted. Some have even called it a total bust. A total bust you say? When it’s a technology that can save lives and improve quality of care? Sadly – that’s the reality. Many argue that telemedicine is not so popular due to lack of awareness among consumers. Be that as it may, it’s not really the primary reason behind a lukewarm outlook towards medicine. As its core, the biggest obstacle to telemedicine is that the laws in our country haven’t caught up with the technology. Have you ever wondered how a doctor makes money when you visit them in the hospital or clinic? The doctor sees you for 30 minutes and prescribes you a drug/ medicine. You leave his or her office. The physician then makes a note of your visit and uses a specific billing code which then generates an invoice that goes to the insurance provider and, ultimately, to Medicare. Same with a phone consultation. At a federal level, to my knowledge, there still is no billing code associated with telemedicine aka a consult done via an app or video call. In recent years, some states have passed laws requiring equal reimbursements for doctors for in-person visits and telemedicine consultations. But it still not a federal law that applies equally across the board. In addition, another impediment to telemedicine adoption is also the fact that many doctors are only licenced in their current state of residence. So telemedicine solutions have also struggled with creating both supply and demand that is confined by state borders. And whereas 8 US states have reached an agreement to allow doctors to practice across their state limits, severe restrictions are in place when it comes to telemedicine. Other concerns include fear of liability from physicians who are afraid of misdiagnosing patients over the phone and the constant fear of making less money when allowing patients to use these digital tools. Bottomline: the law hasn’t yet caught up with the telemedicine technology (shocking, right?). And until either every state passes new legislation to fairly regulate telehealth visits or our congressmen pass a federal law to do the same – this technology will be prevented from reaching its true potential. That said, Telehealth has the potential to significantly improve healthcare services in areas without top quality facilities, and has already shown its benefits in several disaster zones in the African continent. Globally, 3.2 billion people use the Internet, of which two billion live in developing countries — and telemedicine can help provide them with improved patient care. And let us be clear. While its adoption has been slow – telemedicine will pick up in the years to come. For example, late last year, Congress passed the Veterans E-Health and Telemedicine Support law which allows the Department of Veterans Affairs’ providers to cross state lines to practice telemedicine. As soon the legislation catches up with the 21st reality, we will see telemedicine become one of the most talked about healthcare digital trends around. Big data is poised to help scientists, policy-makers and organizations make life-changing policy recommendations by making sense of trillions of data points never before analyzed at scale. Big data has changed the way we analyze large amounts of information in any industry, but has particular relevance to medical and health data. Healthcare analytics has the potential to help patients significantly reduce the cost of treatment, avoid preventable diseases, and improve their quality of life. The same advanced data mining and analysis techniques that have changed a number of industries could enable healthcare professionals to better analyze a patient’s condition and self-care, leading to better health outcomes. Just one of multiple ways to do this is to create a patient’s personalized ‘medical map’, using such simple information as anatomy and physiology as well as more complex identifiers as DNA, RNA, and chemical composition. This kind of information analysis was not possible in the past, and could prove vital in diagnosis and treatment in the future. Another great example of big data in healthcare is the work done by HealX, a British startup which focused on curing rare diseases. HealX is operating in an under-represented market that big pharma doesn’t want to tackle: the 7,000 rare diseases impacting over 350 million people all over the world which have no treatments. According to HealthcareWeekly, “the company is using technology and artificial intelligence to examine the current universe of existing drugs in order to repurpose them for curing rare diseases.” In other words, they’re running complex computations against billions of data points tied to other drugs to hopefully identify new treatments from a list of existing cures and drugs already on the market. Yet another amazing example of big data in healthcare comes from FuzzyLogix. The company is focused on tackling the opioid crisis. By looking at the last two decades of drug prescriptions data, they’ve been able to identify 742 risk factors which can predict if patients are abusing opioids or at risk of abusing it! At the core of big data lies a simple truth: when it comes down to identifying trends in the healthcare space – we’ve really been slacking off for much of the last two decades. There are trillions of data points which can be used to come up with meaningful insights. These insights can be life changing, policy changing or process changing. And as such – they deserve to be analyzed. Interpreted. And we, as a society, deserve to benefit from it. Last but not least, big data is a healthcare trend which has the potential to increase efficiency and reduce costs within organizations as well as within the healthcare sector as a whole. In an industry which is overspending by an estimated $600 billion for a country of the size of the US, big data could bring an improvement where it is desperately needed. And that’s why this healthcare trend is one of the most exciting things we should all be looking for over the next decade. Mobile apps have completely redefined how both patients and doctors receive and deliver medical care. Medical mobile applications are the perfect example of the kind of ease-of-use the dovetailing of technology and healthcare can provide. Applications mean that patients can search for services at the literal tap of a finger. Patients can search for a doctor with ZocDoc, monitor their diabetes conditions using Diabetes in Check, and have access to instant medical information using applications such as MDLive and WebMD. Less well-known, however, is how applications are making life significantly easier for physicians. 80% of physicians use mobile devices at work, with applications such as UpToDate helping doctors have access to the latest medical information on a range of conditions. A number of apps also have the capability of providing personalized care plans based on a patient’s information, and aid doctors in making better decisions in the workplace. In the physician space, over one million doctors in America leverage Epocrates to improve the quality of care for their patients by prescribing the right drugs in the right quantity. Whether your healthcare company is targeted at physicians or the average patient, building an application could mean increased exposure and greater convenience to your target audience. AI is redefining the healthcare industry by improving quality of care, patient outcomes and decreasing costs for hospitals, insurance and payers alike. 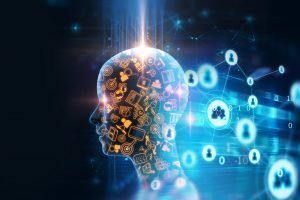 Artificial intelligence is swiftly expanding its reach across a number of industries; especially in healthcare. The technology has the potential to accelerate multiple processes and reduce costs within the industry. AI is being used to analyze large quantities of patient data, and increase the accuracy of disease detection. The use of AI is enabling the review and translation process of mammograms to be 30 times faster with 99% accuracy, reducing the need for unnecessary biopsies, and equipping healthcare professionals to make far better decisions. Microsoft is reportedly working on the development of a machine called the ‘Hanover’, which aims to memorize all relevant medical papers to help predict the optimal drug combinations for cancer patients. An up and coming startup named Verge Genomics uses AI to monitor the impact that specific drug treatments have on the human brain starting with the preclinical phase. As a result, drug manufacturers can get a better picture early on about the effectiveness of a drug on human cells. Artificial intelligence has a potentially large role to play in accelerating research and drug discovery processes. Its use should cut the time it takes for a drug to travel from laboratory development to the patient, which is currently a whopping 12 years on average. Listen to Codrin Arsene, CEO of Digital Authority Partners explain how AI is revolutionizing the healthcare industry here. Cloud solutions are allowing healthcare organizations to be more integrated, interconnected and to store information digitally safely and securely. The healthcare industry requires the management of an incredibly large quantity of data in multiple formats from numerous sources, ranging from patient records, social and medical information, and information about partner organizations. To keep information centralized, health care organizations had to pay for and maintain expensive systems, the capacity of which was often not even reached. With cloud services, organizations need not worry about maintenance, and only pay for exactly what they need. Furthermore, storing information in a decentralized network in the cloud makes storage of this information is more secure because it is not all stored in one place and can be scaled up or down with minimum time lag. 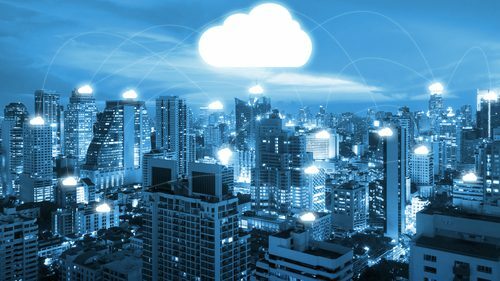 Healthcare organization may be spending too much to maintain local stores of information – a problem easily solved by moving to a cloud platform, even if this may be one of the most underrated healthcare trends out there. The healthcare industry is slowly but surely embracing some of the most exciting healthcare trends today; it is clear that those who fail to incorporate modern technology will be left behind. In such a high-cost industry with a clear potential for increased efficiency, it is of vital importance for healthcare companies to be aware of, plan for, and effectively implement at least some of the new technologies transforming healthcare. 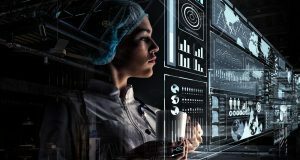 While it may not be realistic to implement all 7 factors driving digital transformation in healthcare, Digital Authority Partners has seen that even rethinking one element can have a significant impact on increasing revenue and freeing up resources for other operations in the healthcare space. Do you need guidance in driving your healthcare organization toward digital transformation? Contact Digital Authority Partners at [email protected] or (312) 600-5433. Do you need guidance with your digital transformation initiatives? Digital Authority Partners has worked with Athenahealth, Omron Healthcare and Blue Cross Blue Shield on cutting-edge digital initiatives that improve patient outcomes and quality of care. Contact Digital Authority Partners at [email protected] or (312) 600-5433.